The use of robotics for palletizing applications continues to be one of the fastest growing segments in robotics. The use of robotic palletizers in distribution or warehouse locations also continues to grow. Yaskawa Motoman line of palletizer robots range from 50 kg to 800 kg payload with 4-6 axes of articulation. Complete line of robotic palletizer models is below. Motoman Strategic Partners, offers application expertise to deliver turn-key robotic palletizing, order picking, or warehouse distribution systems to meet your market demands. Yaskawa Motoman software suite includes MotoSight™ for vision-guided applications and PalletSolver® for homogeneous case or bag palletization are designed for ease of use and ease of integration of turn-key robotic systems. 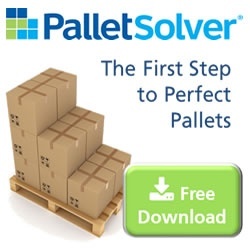 PalletSolver is a pattern generation tool that facilitates quick changeover of pallet patterns or products without halting production for validation. The easy to use full featured palletizing softwareenables offline pattern build/import with constraints handling and interface for monitoring and controlling the entire palletization process with supervisory controls. This software is available for both DX and MLX platforms.